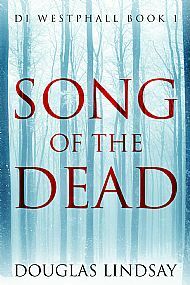 In news that sent the book world into paroxysms of vague curiosity, Long Midnight Publishing today announced the re-launch of Douglas Lindsay's seminal noir classic, SONG OF THE DEAD. IT was a perfect, Christmassy morning in Glasgow, the city covered in a pure white counterpane of snow, as I talked to Dr Ian Shackleton of the Glasgow Institute of Special Things. “It hasn’t snowed like this in Glasgow since 2010,” I said, as we stood at the window of his office on the 93rd floor of the Burj Prepostera, in the heart of Glasgow’s exclusive Carthaginian quarter, sipping warm spiced mochachocca latteccinos from the new hipster coffee place on the Gallowgate, three blocks away. We looked out upon the carpet of white. The streets were unusually silent, the thick snow keeping cars locked in garages, reluctant drivers tucked up in bed. “But I can see the snow,” I said, indicating the city, white as far as the eye could see, stretching in the far distance to the dazzling snow-covered Campsies, etched beautifully against a clear blue sky. Dr Shackleton placed a comforting hand on my shoulder and squeezed. As the Doctor’s words came crashing down like a hammer on the fragile glass of my imagination, the snow melted away, and suddenly we were looking at the city as it really was, beneath a blanket of grey cloud, smeary rain drifting over the low rooftops, passers-by bent double like old hags against the wind. We weren’t on the 93rd floor, there was no Carthaginian district, and we were drinking plain old coffee with a bit of milk, no sugar. Together we looked down from the second floor window at the sad Christmas decorations across the street. A lone dog sniffed at a bin. A woman lay huddled in her sleeping bag in a doorway. A charity shop worker rearranged the Jaeger jackets in the window.